So I haven't been blogging much recently due to being super-busy at work, but when Barrington Stoke (who I love) got in touch about revealing the cover for the new novella coming in January 2018 from Non Pratt, one of my absolute favourite authors, I COULD NOT turn it down! So further down the page we have the wonderful cover by Kate Alizadeh (who also did the awesome cover for Non's first Barrington Stoke book, Unboxed!) 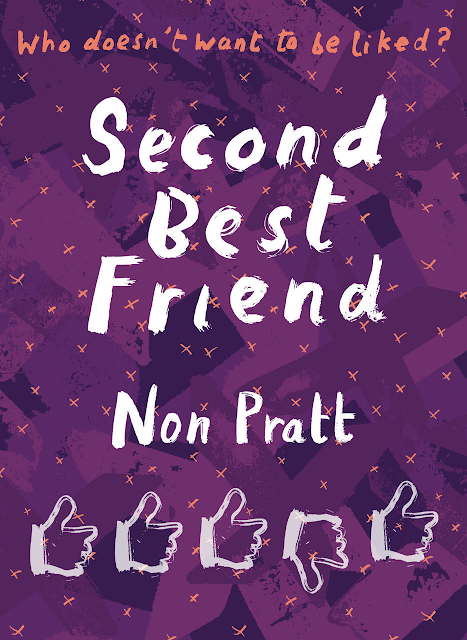 but first, a little bit about Second Best Friend from Non, and a bit more from Barrington Stoke. I’m fascinated by friendship. In Remix I wrote about two friends who lost their way and still managed to lift each other up, but Second Best Friend is Remix’s dark little sister. It’s about the mechanics of best friendship and what happens when others’ perceptions of you press in so tight and merge with your own than you can’t tell one from the other. It’s about the insidious nature of jealousy and how it can distort you. It’s also about politics because if there’s one time people will do anything to win, it’s during an election. Jade and Becky are best friends, but when Jade’s ex-boyfriend lets on that everyone thinks Becky is the better of the two, Jade finds herself noticing just how often she comes second to her best friend. There’s nothing Jade is better at than Becky. So when Jade is voted in as Party Leader ahead of her school’s General Election only to find herself standing against Becky, Jade sees it as a chance to prove herself. If there’s one thing she can win, it’s this election – even if it means losing her best friend. Second Best Friend publishes on 15th January 2018 - I can't wait! A huge thanks to Non and to Barrington Stoke for letting me host this reveal.